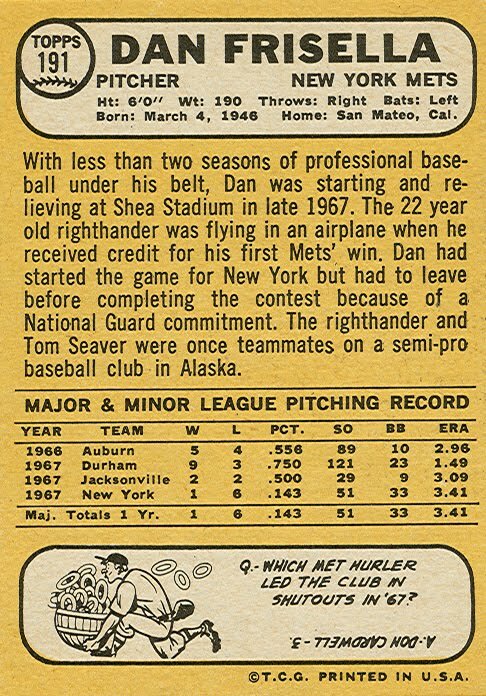 This is the rookie card for Danny Frisella, a relief pitcher for the Mets and others from 1967 to 1976. 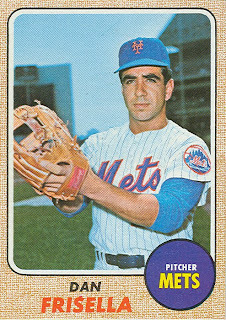 Frisella was signed by the Mets in June 1966. 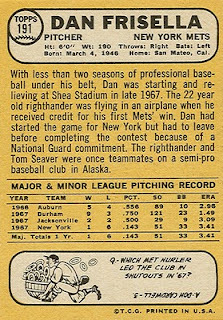 During his time in the Mets' minor-league system (1966-1970) he was a starting pitcher. 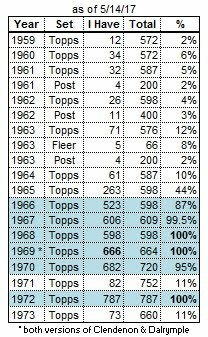 He compiled a record of 11-5 during the first half of 1967 (in A and AAA ball), and then made his major-league debut on July 27th, starting 11 of his 14 games during his rookie season. 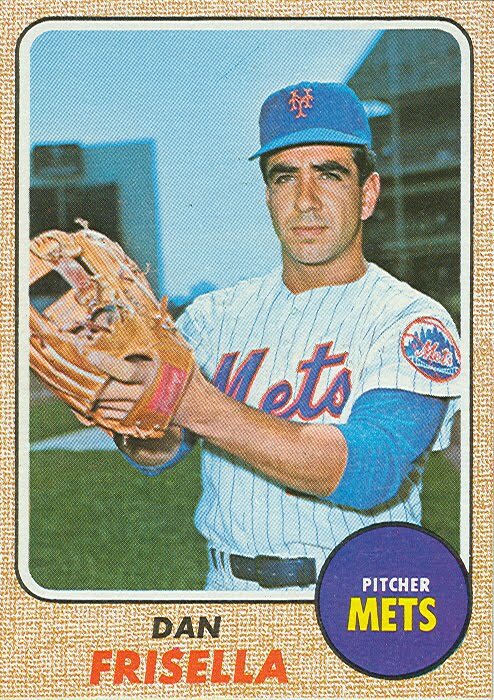 Frisella started 13 games for the Mets' triple-A team in 1970, and rejoined the Mets' bullpen, where he appeared in 30 games as the setup man for closers Ron Taylor and Tug McGraw. He won 8 games in each of 1970 and 1971, and became the right-handed closer in 1971, leading the team with 12 saves. 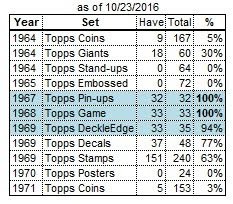 In 1972, his record slipped to 5-8, and his saves dropped to 9, as lefty Tug McGraw picked up most of the team's saves that season. After the season, Danny was traded to the Braves (with pitcher Gary Gentry) for 2nd baseman Felix Millan and pitcher George Stone. Frisella spent 2 seasons in the Braves' bullpen, and was traded to the Padres for outfielder Cito Gaston in the off-season. He was the Padres' closer in 1975, and although he compiled a 1-6 record, he led the team with 9 saves. After only one season, he was traded to the Cardinals on April 8, 1976. Two months later, after only 22 innings pitched, he was shipped to Milwaukee, where he became the Brewers' closer, again leading his team in saves. On January 1, 1977 Danny Frisella was killed in a dune buggy accident in Arizona at age 30. Here is a message board on the Ultimate Mets Database site, where fans (and Frisella's widow) have posted their comments.